Jerusalem is being destroyed. Completely. Men, women, children even the animals. Sounds like a harsh moment for God’s people. It is. Make no mistake things are as bad as it gets. Even the Holy Temple is being destroyed. Why? They turned their back on God. Now it sounds like a harsh God. It does sound that way but we have to look at a couple of factors. God pleaded with them for YEARS, even generations to return to HIM as their One True God. They knew Who HE was and how HE cared for them. But still they turned away. Jeremiah remembered! In the midst of all this pain and suffering, he remembered. He remembered the faithful love of the LORD. He remembered His mercies. They both NEVER end and will NEVER cease! 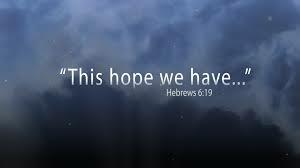 Jeremiah’s hope and our hope is in the love and mercy of a never ending God! HE is our HOPE! My hope today is that no matter what you are going through you will “dare to hope” just one more time. Hope in the ONE who will never cease to love you and show you mercy each new day.